Noticed a bunch of these guys while out and about today. The approx size of the ones I saw was in the #14 range. On a northern Delaware State stream no less!! Check out this pattern if you are looking for a good subsurface imitation. 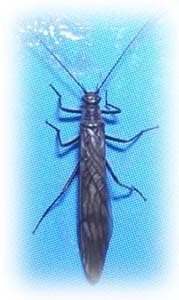 When in a pinch for a dry pattern use an all black caddis....better yet would be to tie up a bunch of all black caddis with longer than nornal elk hair - extending the black elk hair about an 1/8" beyond the hook shank. Might as well get out and enjoy this nice weather. There is no doubt we will be getting another bout of ole man winter in due time. Be sure to check out of special deals. And if you have any questions about throwin' the fly in PA - don't hesitate to send us an email. Preferred dates are going fast! .and all it really is is a variation of a flashback hares ear tied on a tmc 2487. I would consider this fish a quality wild trout no matter where it was caught in PA.
For now though it looks like we are back to winter. If you have any questions about our services don't hesitate to give us a call or shoot us an email. Picture at left is the ultimate nymph. This is a simple tie, of which you should have a decent array of sizes in your box. Hopefully the pop-up got your attention. This is an extremely important issue and very well could be a precedent setting decision. Please take some time to write a letter or two and e to this addy: ra-pfbcregs@state.pa.us. Protection of ALL our wild trout waters is at stake. It is crucial the new Executive Director of the Pennsylvania Fish Commission hear from us, so he knows where we stand on how Pennsylvania's trout fishery be managed. however I do not believe that will be happeneing this year. If you are looking for a nice pattern to match the nymph, then check out our patterns page. Take a look. We have some exciting news about the upcoming season. FFPA would like to announce we have obtained exclusive use of a private ramp on the grounds of The Wildlife Information Center, along the banks of the Lehigh. We would like to thank the Center for this right. Located in Slatington, PA, The Wildlife Information Center, does great work in preserving the wildlife and habitat in this critical environmental area. Check out what they are doing to the stark landscape of the Kittantiny Ridge. Cool stuff! This is just upstream from the this new access point. 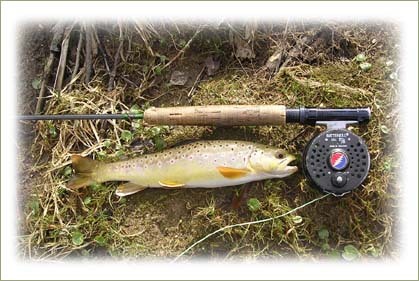 As for the angler this puts you into perfect position for take advantage of some of the best dry fly water found on the Lehigh. This will make a great access point for our Evening Rise float trip packages. Also, this ramp opens up many more floating opportunities. Interested in floating the Lehigh - send us an email. Well the Holidays have come and gone, and winter currently has a tight grip on Pennsylvania with subfreezing temps for highs. Now it is time to prepare for spring, by tying flies, making leaders, cleaning lines and oiling up the reels. During the winter months we will be updating the website from time to time with hopefully a few interesting articles, fly patterns along with some tidbits of information. A recent addition to the site is a feature called Featured Streams, that describe some of our favorite pieces of water in the state. During the winter months look for a few more waters to be added to this feature. Also look for "Who is Fly Fish PA?," and a special announcement concerning access on the Lehigh River. Anticipation of great angling, in the upcoming year, has already led to numerous bookings to date. Currently almost every weekend in May is booked. We still have one spot remaining for our Penns Creek Weekend, May 1-2. Our annual TCO Spring/Penns Creek Trip on May 23-24 is beginning to fill up too. If you are interested in this trip, contact TCO to reserve a spot. Our remaining May weekend dates are filling with Lehigh Float and Tully wade trips. If your interested in a weekday trip, please reserve your date as early as possible so we can plan accordingly. June will bring our annual pilgrimage to the MECCA of saltwater fishing, Martha's Vineyard. All who participate in this outing are already hyping it up and it is only January. We also have another trip available to Penns Creek on June 12-13. This one is currently wide open. June is also prime time on the Lehigh River. By the end of the month we hope the Susquehanna will be flowing at a level that will be conducive to fly fishing. Maybe this year we can touch this river since the 2003 season on the 'Hanna was a bust due to all the rain. Talk about a fun water to fish for an angler of any skill level. Time to start tying those flies. Check out our Featured Streams Page.